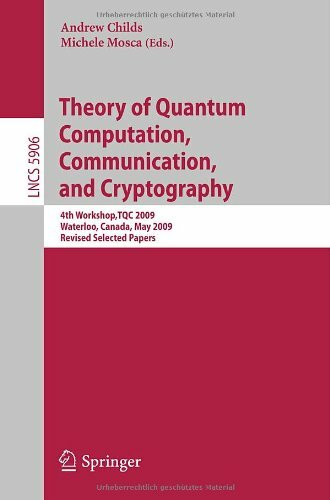 This book constitutes the thoroughly refereed post-workshop proceedings of the 4th Workshop on Theory of Quantum Computation, Communication, and Cryptography, TQC 2009, held in Waterloo, Canada, in May 2009. The 10 revised papers presented were carefully selected during two rounds of reviewing and improvement. The papers present current original research and focus on theoretical aspects of quantum computation, quantum communication, and quantum cryptography, which are part of a larger interdisciplinary field embedding information science in a quantum mechanical framework. Topics addressed are such as quantum algorithms, models of quantum computation, quantum complexity theory, simulation of quantum systems, quantum cryptography, quantum communication, quantum estimation and measurement, quantum noise, quantum coding theory, fault-tolerant quantum computing, and entanglement theory.